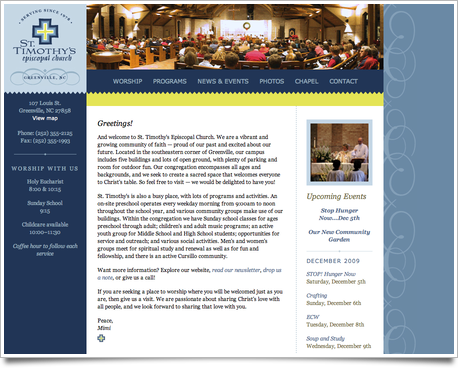 It was around this time last year that I started talking with my dad about redesigning our church’s website. He had designed and been maintaining it in Microsoft FrontPage for several years, and it was getting a bit long in the tooth. I knew it would be a hard sell. He was (rightfully) proud of everything he had learned and done with the site over the years, and he was doing a good job of keeping the information current, even if the technology had fallen behind. But he knew that people weren’t really using the site, and it was frustrating him. Ultimately, we took nearly 50 existing pages and consolidated them into about 12 pages on the new site while adding a little bit of spiffy on top. 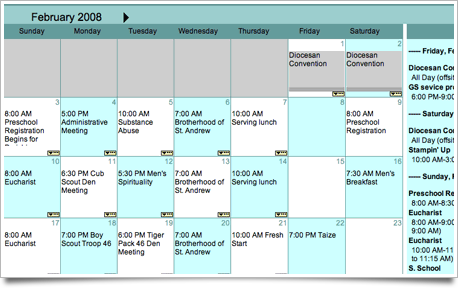 In addition, important events are automatically highlighted both on the site’s home page and the calendar pages. The secretary only needs to mark them “high-priority” in Outlook before exporting. 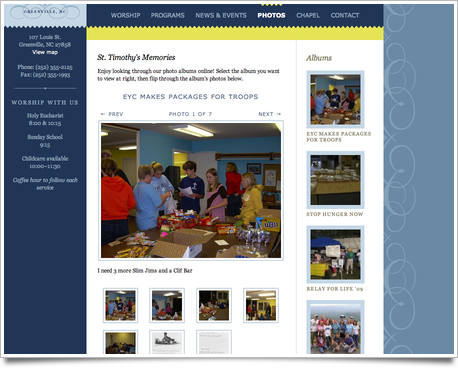 The old site had several photo galleries sprinkled throughout various pages. Some were on their own page, some were part of another page, and others were hosted on another site! We thought it would be better to have all the photos in a central spot where they’d be easy to peruse and easy to come back to later on. Now all the photo galleries are consolidated to a single page. The site’s webmaster (i.e., Dad) manages the photo galleries through an administrative interface, so he doesn’t need to run all the updates through me. 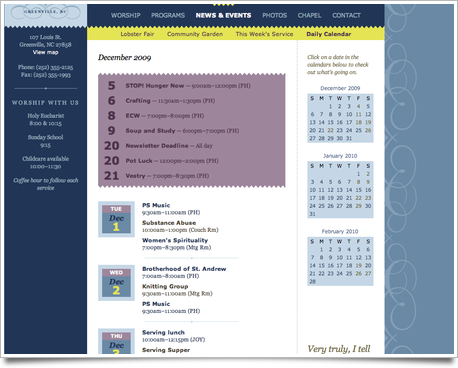 We were all really pleased with how the site turned out. It was a major overhaul and took a lot of work and patience on everyone’s part, and we’ve been excited to get positive feedback from the parishioners. Feel free to visit the site and browse around.